If you’re in the market for a work boot that works every bit as hard as you do, then Thorogood features the American Heritage 6” Safety Toe Boot which has made it to our list of one of the top work boots available. BootRatings strives to provide you the additional information you require in determining which style of work boot is best for your occupation. This particular style is packed with safety features to adequately protect your feet while you work in industries such as heavy construction, steel working, logging, etc. Let us further explain why we feel these boots deserve to be on our list. These steel toe boots that are ASTM rated F2413-05 M/I/75/C/75 Electrical Hazard. These boots provide comfort right out of the box with the minimal break in time; they are also true to size. 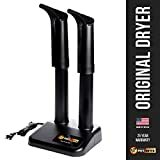 In addition, the insole, midsole, and outsole of these boots provide ample cushioning and shock absorption and are a nice choice for someone with back or knee problems. Plus, they are equipped with a lightweight fiberglass shank that supports your foot where you need it the most. Furthermore, the leather shaft is padded for additional comfort. Check out our reviews of the most comfortable work boots. If you’re looking for a boot that is built for extreme working conditions, these are them. Occupations such as steelworkers, electrical engineers, or electrical engineers would benefit from this type of boot. They are designed to protect your feet from injury, and provide the comfort you require if you are on your feet most of the day. These are not waterproof boots, however, if you apply a water resistant application, it will assist in detouring moisture. However, if your job requires you to work around water, we would suggest a more fitting match for those elements. < img> As a work boot designed to last when put to the ultimate test, they are constructed out of durable materials such as oil tanned leather, Goodyear welt construction that attaches the sole to the boot, plus a highly durable outsole with rugged traction that keeps you on your feet. However, as we mentioned, these boots are not waterproof and would not suggest subjecting them to wet conditions. Click to learn how to waterproof them or check our waterproof work boots list! 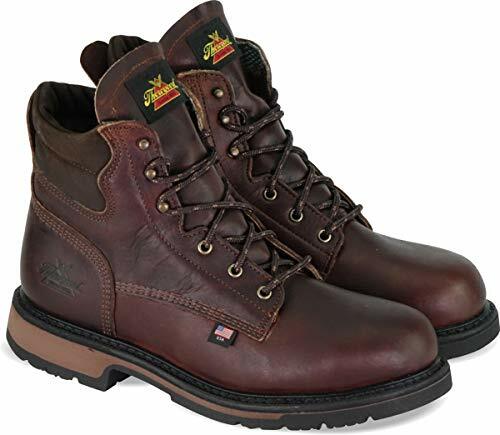 Thorogood is a highly reputable name brand in work boots and shoes. They have been manufacturing since 1892 and most of their styles are made in the USA. Their most popular line is the American Heritage collection. In addition, they are quickly growing in popularity because of their dedicated craftsmanship, and top notch features. They are the go-to brand for many police officers, oil and natural gas workers, as well as heavy construction workers. They are not waterproof which we believe is the biggest downfall for these work boots as they do feature all other ingredients for a perfect work boot. Also, the toe box is a tad bit constricting for someone with wider feet. They are constructed with oil tanned leather, solid brass hardware on the lace-up feature, rubber midsole and outsole, polyurethane comfort sole, fiberglass shank, and steel toe.